In my last post I wrote about why you should take a look at ASP.NET MVC. 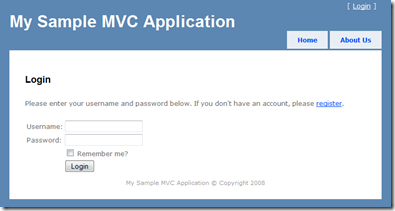 With this blogpost I want to go a little bit deeper into the MVC universe. 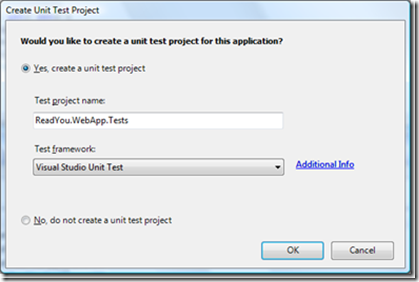 ASP.NET MVC is very testable and ask you if you want to create a unit test project. 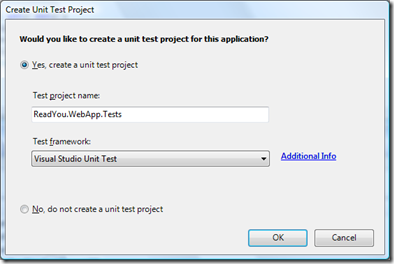 I recommend you to do that (or create your own unit test project) - unit tests are a great way to produce high quality. 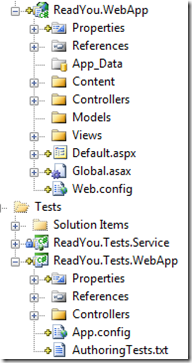 The default test framework is MSTest, other frameworks will be added later (hopefully :) ). The "Shared" folder contains all viewelements that could be used by other views, like the masterpage or some common controls. 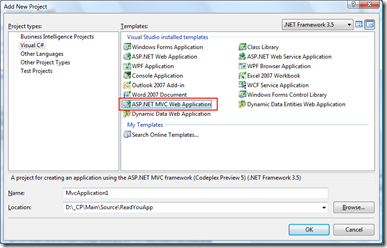 This "path"-configuration can be modified by using the diverent interfaces, hier are 2 good examples "Partitioning an ASP.NET MVC application into separate "Areas"" and Rob Conerys version. The data in the dictionary will be send to a view called "Index" in the "Home" folder, because the action method is a method of the "HomeController". 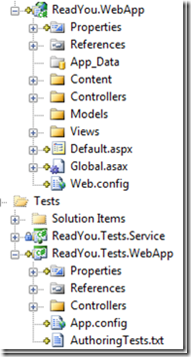 You can specify a view in the "View(YOURVIEW)" method, but if you just use the "View()" method the MVC framework will route the data to a view namend like the action method itself e.g. "Index". The data in the "ViewData"-dictionary are rendered though the inline code. There is no code behinde file, it´s similar to PHP/JSP or classic ASP. The benefit of this approach is, that you get a more robust application and have a "contract" between the view and the controller. Warning: The "ViewData["Title"]" is still in use, because the masterpage needs this data. 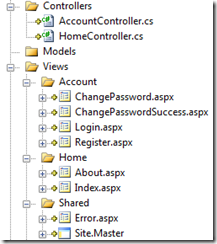 In the MVC universe the controller is responsible to send all data to the view (there are some ideas how you can create an get an independent control). 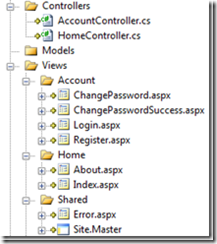 The view talks to the controler via normal HTML links or forms (GET/POST data). Option 1: Via GET or the "ActionLink"
please <%= Html.ActionLink("register", "Register") %>. The request will be routed to the "Register" action method on the "AccountController", because this view is inside the "Account"-folder and the second ActionLink parameter contains the name of the specific action method. The Url.Action Helper create the action URL for the form. The form values will be submitted to the "Login" action method of the "AccountController", beacuse this view is inside the "Account"-folder. The form values are automatically mapped to the method parameters. This mapping could be modified. Stephen Walther wrote a nice blogpost about this. And there is a great screencast how the binding in ASP.NET MVC works on Dimecasts.net.